For weeks the killdeer has darted about our newly mulched backyard, searching for worms within the soggy layers of cardboard, manure, and leaves. The composting material provides a welcome habitat for the small bird, her tawny top feathers a near-perfect match with the ground itself. So much so that I have only recently spied her nest. It sits six or seven feet southwest of our silver maple, right next to a large white stick, a landmark that now allows me to locate the nest easily from my living room window. Shift my eyes a few inches in front of the stick, and there, barely perceptible even with binoculars, is her tiny brown and white head, turning slowly from side to side. Aside from her forays across the yard for food, the killdeer sits all day on her nest, the shining black center of her eye watchful and alert. For a while, a male bird foraged with her. In the evenings I heard his kill-deer cry and saw him wheeling through the air over our yard. Lately he has been absent, his whereabouts a mystery. I worry a raccoon may have taken him, or one of the glossy crows that patrol the yard, scaring all the smaller birds away. I moved into this house barely a year ago with my husband, Marc. We sheet-mulched the entire yard this winter in an effort to improve our dense clay soil and create an encouraging climate for the fruit trees, vegetables, and herbs we hope to grow. It’s just the two of us here, along with our cat. No kids. I was thirty when I began to consider children, thirty-five before my biological clock began an unexpected and urgent ticking. I married at thirty-seven. After our wedding, just as my baby longing reached an acute level, Marc left our Oregon home to attend graduate school in New York. It was a joint—if poorly formulated—decision. I intended to join him once he got a job that could support us both while I looked for my own, but with a faltering economy the search took much longer than we’d anticipated. By the time Marc found work, he was nearly halfway through his graduate program, and trading my fulfilling job in the place we ultimately wanted to settle for the vague hope of one in a place that we didn’t felt unwise. So for three years, my husband studied and worked on the East Coast, I worked and waited on the West, and we tried to time our conjugal visits with the dropping of my eggs. It was not what I had envisioned for our first years of marriage, but Life, as they say, is what happens when you’re busy making other plans. Marc is back in Oregon now, and having squandered nearly three fertile years, I am doing what I can to encourage conception. I have eliminated morning coffee and pop prenatal vitamins with every breakfast. I schedule monthly abdominal massages and weekly acupuncture treatments, ride the daily hills and dips of basal body temperature shifts, exercise regularly, and eat well. I still have regular periods. Despite my health, I harbor only the most cautious optimism. Conceiving becomes progressively harder as a woman reaches her late thirties and early forties. 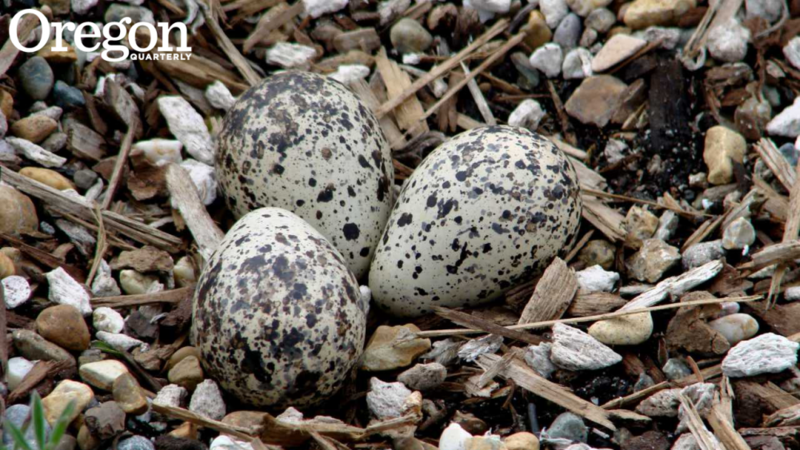 As the years accumulate, the overall viability of her remaining eggs drops. She might still ovulate, as I do, but a good percentage of those eggs may have no chance of becoming children. At the age of forty-one, pregnancy is something to work at. Preoccupied as I too often am with the many facets of a full life, I only gradually became aware of the mother killdeer’s presence on my property. I can’t remember when I first heard her piercing call, but now that I know she is here, I listen for the sound, watch for her darting movements, her nimble dash across my yard. She reminds me of ocean birds: long legs made for wading, quick reflexes perfect for chasing tides. At first, I worry she is too far from home, has placed her eggs in unfit ground. I am relieved to learn that killdeer aren’t shorebirds, and that the muddy field of our yard is enough. The killdeer’s presence slows and settles me, makes me more watchful, attentive. She calls forth in me as well an unexpected sense of responsibility. For reasons unknown, this spindly-legged mother has chosen my home for her own, and I am determined to protect her, to help see her nesting mission to its completion. When I hear her shrill cry, I run to the patio door, clap my hands to warn off the squirrels and the hulking black crows that retreat at the sight of me to hang on the fence and telephone wires. Several times I have heard the killdeer’s trilling alarm and caught our cat stalking her in the leaves. I have taken to keeping him inside at night so the poor mother can get some uninterrupted sleep. One recent spring evening, as Marc and I relaxed on the patio, the cat slunk across the yard, an orange-and-white beacon in the drab surround, belly hugging the ground, tail trembling in predatory anticipation. In a dance they’d shared numerous times, the killdeer leapt from her nest and hopped clumsily about, trailing her wing in the dirt as if it were broken. She stayed close enough to keep the cat interested, far enough away to elude capture, luring him slowly away from her eggs. I knew from experience that once he’d been adequately distracted, she’d spring suddenly into flight, then whirl around the perimeter of the backyard before landing, safely, on her nest. This time, however, I didn’t wait for the scene to unfold. “Psst! !” I scooped a handful of gravel from the path and flung it in the cat’s direction, called his name until he came back to me, then put him in the house. I don’t know what I’ll do once those eggs hatch. There is a significant alternative community in the Oregon town in which I live, a visible cohort of adventurous, nontraditional types. Some were Oregon-raised from homesteading stock, while others headed west in early or middle adulthood, forsaking the faster pace of eastern cities for a lower-key lifestyle. Still others came for college or graduate school, fell in love with the landscape, and never left. Many, like me, have delayed childbearing in favor of other pursuits: adventure, personal growth, education, a driving sense of mission. It’s not terribly uncommon here to meet a new mother in her early forties, a first-time father in his fifties. A friend, an obstetric nurse, reports increasing numbers of patients of “advanced maternal age,” and everyone I know can name at least one of them: women who conceived despite the odds. My neighbor had her son at thirty-nine, her daughter at forty-one. My cousin became unexpectedly pregnant at forty-four. The woman I sang with in the choir, after years of infertility, gave birth at forty-seven. A good friend had her first at forty. For a long time, these stories have sustained me, but lately, my hope has started to flag. Simply put, I’ve begun to wonder whether we’ve waited too long. For years, friends hinted at this eventuality. The same prudent friends who, soon after college graduation, began to envision marriages, houses, minivans crammed with car seats and littered with crushed Cheerios. Despite my sometimes uncertainty about motherhood, I have been fascinated by their pregnancies, and compelled by the experience of childbirth itself. During my late twenties and thirties, I attended six births, four times as a doula for my younger sister. Each time, whether in home or hospital, I cried the moment the head emerged, stunned anew by the sight of a human being taking shape on the sheets or an open-faced mer-child spilling into the waters of a birthing tub. Each time, rocked to my core by awe and joy, my body registered a subtle mix of recognition and desire. And each time, I felt simultaneously and strangely bereft, as if some part of me suspected that the experience touching me so deeply might never be mine to have. This morning I stayed home from work, recovering from a sudden and severe bout of abdominal pain that drove me to the emergency room yesterday. The doctor had no explanation, but after trying so long to conceive, everything has become a sign, either of a potential pregnancy or the futility of continuing to try. I lie in bed for a long time, wondering whether my period is coming with an unprecedented vengeance, whether I might be developing perimenopausal endometriosis, or whether my ovaries have been harboring a cyst, a sly saboteur which yesterday morning reached its inevitable bursting point. I consider the possibility that my infertility is my just desert, some sort of karmic punishment for the ambivalence of my younger years. Or that Destiny, perhaps, has laid out a crooked path all her own. If I want to mother, I know, there are many viable options. For now, however, my body wants its say. The killdeer has been silent all morning. When I finally get out of bed, I walk first to the living room, stand at the patio door. I locate the white stick, scan the patch of earth in front of it. Nothing. I pull out my binoculars. There is no small brown and white head, no shining black eye, no dragging wing. I slip into my clogs and, still in my pajamas, make my way through the mulch to the killdeer’s spot. I squat down beside the nest. It is the first time I have been so close. Within the sticks and mud sit three greenish-gray eggs, tiny and perfect, laid in a lovely rounded triangle. My heart catches in my throat. There is no sign of the killdeer, but no telltale feathers mark the ground either, no evidence of struggle. I return to the house, and throughout the day peer anxiously out the back windows, waiting for her to appear, listening for her call. I consider covering the eggs to keep them warm, but fear my scent might drive her away for good. I suspect our cat, not of killing the mother bird, but of simply tiring her out. When Marc comes home from work I relay the bad news. Seeing my troubled face, he tries to comfort me. Maybe she just went somewhere for the day, he offers. I shake my head. No mother intentionally leaves her eggs unattended. Something must be wrong. I know this. It is nightfall now, and the mother bird has not returned. I have no idea what has become of her. I hide in the bathroom, behind the door. I have cried before, but this time the grief wracks me, throws me against the linen closet, then down to the floor. My chest hurts with it, eyes swell nearly shut. I cannot stop. With my whole body I grieve for the little bird, for the three small eggs lying alone in my back yard. In the deepest part of me I know the truth: she will not be back. My home is not the right nesting place after all. Mary Funk migrated eight years ago to Oregon, land of her homesteading grandparents and her father’s childhood. She lives, works, plays, and writes in the loving company of her husband, cats, and community, both human and wild.